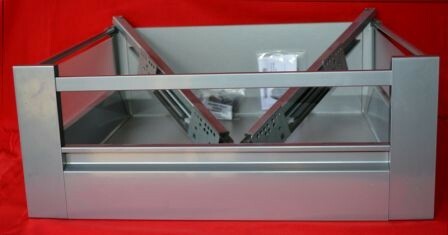 These are our DBT Internal Soft Close Kitchen Drawer Box, available in heights of standard 95mm high and 224mm high. If your kitchen unit has door hinges. We will then supply required brackets to fit however, drawer box will be 25mm smaller or if hinges both sides than 50mm smaller. The width you choose should be the width of the unit not the drawer box – we make the drawer box fit your unit size. These are soft closing internal drawer boxes prefect for adding additional storage to a unit in your kitchen. How to accurately measure the dimensions of your carcass: See our How to Measure Guide. Please don’t hesitate to Contact Us if you need more assistance. The drawer box is to fit a 18mm or 15mm carcass. The drawer box comes with; 1 x pair of soft close sides, runners and drawer front. The internal kitchen drawer box is 18mm bottom and back.